Brock Lesnar turns 34 years old today. 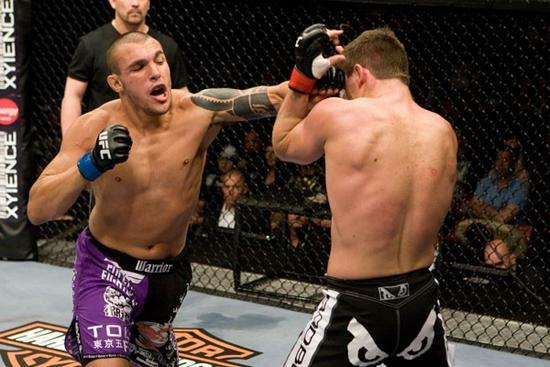 The former UFC champion is still recovering from surgery and we hope to see him in the Octagon again soon. Happy birthday, champ! Professional Muay Thai comes to New Jersey in less than two weeks, at the RJ Collins Arena in Lincroft. The card is being finalized now, and it a great mix of professional and amateur bouts. Many MMA fighters cross train in Muay Thai, and on this card you'll see some MMA fighters competing. Tickets are on sale now, so click on the poster above to get yours before they are sold out. In a previous article we mentioned a legendary Muay Thai fighter named Kaensak Sor Ploenjit, who is now the Muay Thai coach at AMA Fight Club, home to the Miller brothers and other top UFC fighters. Kaensak is also a licensed MT judge and will be on hand on July 23 judging the professional bouts. Do not miss this show! Luiz Cane is training hard for his UFC 134 match against Stanislav Nedkov in Brazil next month. The Sao Paulo native is one of many Brazilians featured on the stacked UFC Rio card, and he's excited to be fighting back home. "It's feels great to fight in my home country, it's an honor for me," he said. Cane is coming off a much needed win at UFC 128 last March and hopes to keep things going with a win over Nedkov, who is making his UFC debut. Luiz knows that there are no easy fights in the UFC. "My opponent is a strong guy," he said. "He has a good wrestling base as well as being a BJJ Blackbelt. I think that our styles match up really well and I am as always looking to give the fans what they want to see. A great fight." Great fights have been a hallmark of Cane's career: Only one of his 11 wins has gone the distance,with 8 wins coming in the first round. Luiz likes to stand and bang and he's stopped 9 of his opponents by knockout. This KO ratio is reminiscent of another great Brazilian fighter, the legendary Wanderlei Silva. There has been talk over the years of a beef between Cane and Silva--to the point where even his Wiki page says that he is "known to dislike Wanderlei Silva due to issues back in Brazil." Cane say in no uncertain terms, however, that those rumors are not true. "This is pure BS," he said. "The truth is, in 2008, a stupid guy posted an fake interview in some MMA forum. He said he interviewed me at UFC Fight Night 15 in Omaha, Nebraska. But on that day I was at my home in Sao Paulo, Brazil. I never had anything against Wanderlei. He is one of my heros in this sport and I'm a huge fan of Wanderlei Silva. I used to stay awake all night to see his fights in Japan, and at the begining of my career he inspired me a lot with his agressive style. I used to see his fights and think, Man, I want to fight like this guy." So far Cane has been doing a bang up job of fighting like his hero, and he's looking to showcase those aggressive skills against Nedkov on August 27. Will there be more pressure on him to win because he's fighting in Brazil? "I don't think it puts more pressure on me to win," he said. "I always want to win no matter where I fight." Cane is training down at the Armory in Jupiter, Florida to prepare for his fight in Brazil. The Armory is also home to the fast rising star Edson Mendes Jr, aka Edson Barboza. Both he and Edson are managed by Joe Mullings, who has been doing a great job guiding their careers. Check out this video of Luiz Cane putting a hurting on James Stelly with his knees from the Muay Thai clinch. We'll have more on Cane in the near future, including some exclusive training pics. SAN JOSE, Calif. – STRIKEFORCE® returns to Illinois for the first time since 2009 with one of its top fight cards of the year. Having already announced the heavyweight super fight main event between Fedor “The Last Emperor” Emelianenko and Dan “Hendo” Henderson, STRIKEFORCE officials today confirmed the remainder of the loaded main card, which will air live on SHOWTIME at 10 p.m. ET/PT (delayed on the West Coast) from the Sears Centre Arena in Hoffman Estates, Ill.
Women’s 135-pound champion Marloes “Rumina” Coenen will defend her crown against Miesha “Takedown” Tate in the exciting co-main event, while middleweight contenders “Ruthless” Robbie Lawler and Tim “The Hero” Kennedy are also set to collide. Plus, the night’s action will feature a pivotal welterweight bout pitting Paul “Semtex” Daley and Tyron “T-Wood” Woodley, as well as a 170-pound contest between Scott “Hands of Steel” Smith and Tarec “Sponge” Saffiedine. Tickets for STRIKEFORCE®: FEDOR vs. HENDERSON, which is presented by Rockstar Energy Drink, are on sale now and are priced at $352, $202, $102, $77, $52 and $37. Tickets will be available at the Sears Centre Arena box office, online at searscentre.com, or charge by phone at 1-888-732-7784. Ticket prices do not include service charges. Having already successfully defended her 135-pound women’s title against Liz Carmouche in March, Coenen (19-4) is ready to get back into the cage and show MMA fans why she’s one of the best female athletes in the world. Fighting out of the Golden Glory gym in Amsterdam, Netherlands alongside Alistair and Valentijn Overeem, Coenen is looking to display the grappling skills and signature submissions that have made her one of the division’s elite. She’ll take on top contender Tate (11-2), who is currently riding a five-fight win streak that dates back to October 2009. The Tacoma, Wash. native, who currently trains at Team Alpha Male in Sacramento with UFC bantamweights Urijah Faber and Joseph Benavidez, is ready to end Coenen’s reign atop the 135-pound division. A veteran of UFC, Pride and EliteXC, Lawler (18-7, 1 NC) hits the STRIKEFORCE cage once again on a mission to rule the middleweight division. A member of Matt Hughes’s H.I.T. Squad in Granite City, Ill., Lawler’s strong wrestling base and knockout power have provided a quick end to many of his past fights. He’ll look for another dramatic finish on July 30 when he takes on San Luis Obispo, Calif.’s Kennedy (13-3). The U.S. Army Green Beret and Operation Iraqi Freedom vet has been given the opportunity to fully dedicate himself to his MMA career and has put the rest of the division on alert. Coming off a recent win over Melvin Manhoef, the Greg Jackson-trained fighter seeks another impressive win when he meets Lawler at the Sears Centre. Top welterweight and British knockout artist Daley (27-10-2) looks to spark another run at the welterweight crown he takes on undefeated two-time All-American wrestler Woodley (8-0) on July 30. The road back to the title won’t be an easy one. Woodley, who starred at the University of Missouri, is one of the fastest-rising fighters in the sport thanks to his versatility and knack for finishing opponents. Former top middleweight contender Smith (17-8, 1NC) steps into the STRIKEFORCE cage this month with the goal of wreaking havoc on the welterweight division. Owning wins over the likes of Cung Le, Kyle Noke and Tim Kennedy, the Muay Thai and boxing standout will be pushed to the limit when he meets Belgium’s Saffiedine (10-3). Currently training with Dan Henderson’s Team Quest in Temecula, Calif., the 24-year-old karate black belt will look for another submission win to add to his already impressive total. John "Doomsday" Howard, a hard-hitting exciting fighter, has been released from the UFC. Howard got off to a great start in the UFC, winning his first four fights in a row. Unfortunately, he lost the next three fight, the latest a decision loss to Matt Brown last month. The release has been confirmed by Howard's manager Malki Kawa to MMAWeekly. The one heartening thing about this is that the UFC never says never. There is a good chance that Doomsday might be back in the big show after winning a couple of fights elsewhere. So good luck to John "Doomsday" Howard! Warrior's Cup XII: July 23: History in the Making! Big news for combat sports fans: for the first time ever, professional Muay Thai is coming to New Jersey. 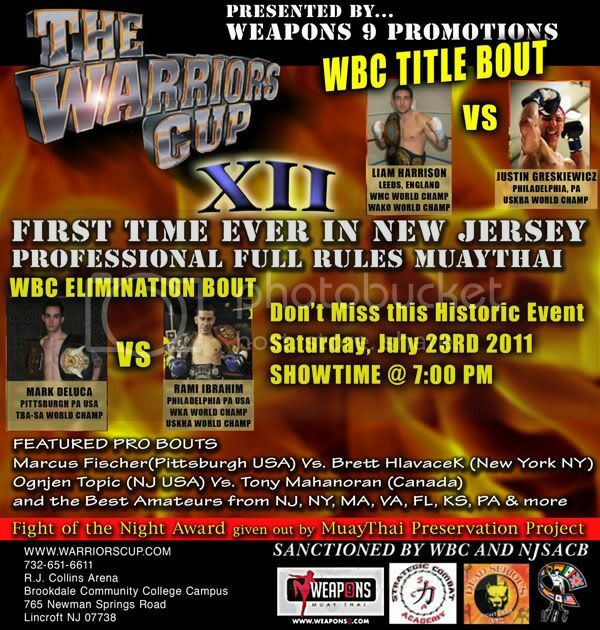 Warriors Cup XII, presented by Weapons 9 Promotions, will take place on July 23rd, and will feature some of the best professional and amateur Muay Thai fighters in the world. The main event, sanctioned by the WBC, features two world champions vying for the WBC world title. Liam Harrison of England takes on Philadelphia's own Justin Greskiewicz in a bout that is sure to have the RJ Collins Arena rocking. This is a historic event that will usher in a new era of combat sports in New Jersey and on the East Coast. Promoter Christian Tran is excited to bring professional Muay Thai to the Garden State in order to give the world's best pro fighters a chance to compete in the sport they love. "Our show," said Tran, "has been, is, and always be about Muay Thai and the fighters and trainers that commit themselves wholeheartedly to this beautiful combat art. We do not consider ourselves 'promoters' but rather true fans of the sport." This show will be a sold out quickly, so jump on the opportunity to get tickets right away. I will be at the Arena hosting the event from inside the ring, and hope to see everyone there. Come be a part of combat sports history! See you on July 23rd! (Milwaukee, Wisconsin, USA): This past December, current UFC® lightweight contender Anthony “Showtime” Pettis took the MMA world by storm with an eye-opening flying kick that precipitated his victory over Ben Henderson at the final WEC® event in history. With that strike, now known as the “Showtime Kick,” Pettis entered the national consciousness, as he was featured on highlight reels on sports stations across the country. Now, “Showtime” has the opportunity to attain a level of mainstream acceptance that few MMA fighters get the opportunity to reach, as he’s been nominated for ESPN’s “Play of the Year.” MMA is also represented in the “Upset of the Year” and “Fighter of the Year” categories, as Fabricio Werdum’s shocking defeat of Fedor Emelianenko, Georges St-Pierre, and Jon Jones are nominated, respectively. Currently matched up against a tag team interception by Oklahoma St., Pettis’ kick is one of sixteen nominations for “Play of the Year.” Fans will need to vote for the kick for it to proceed through the tournament. It is the only representation of combat sports in the field. Fans can vote online for the ESPY’s at http://espn.go.com/espys/#!/voting/. NOTE TO READER : Dr. Tom Deters has published hundreds of article in the areas of strength and conditioning, performance nutrition and performance enhancement. As former Editor in Chief of Muscle & Fitness magazine for fifteen years, he has trained with, worked with and interviewed dozens of professional bodybuilders, NFL strength coaches and has been featured on national television to discuss anabolic steroids and performance enhancing drugs. He is one of the co-founders of www.JiuJitsuMania.com and holds an advanced belt in Brazilian Jiu Jitsu. If you wanted to argue that combat athletes (MMA fighters and their cousin competitors in Brazilian Jiu Jitsu, boxing, Muay Thai and wrestling to name a few) subject themselves to some of the most intense, brutal and stressful training in all of sport, you would have a pretty solid argument. Not only do combat athletes train at highly anaerobic levels, but they endure stress, pain, undergo extreme measures to make weight and experience pre-fight adrenaline dumps that few athletes will ever experience. These young men who entertain, motivate and inspire millions deserve not only our respect, but the very best medical and health care on the planet. How ironic, that due to both ignorance and misunderstanding of medical research data by the mainstream media, the general public, some (not all) sanctioning bodies and the athletes themselves, fighters are conditioned to be “testosterone phobic”. This could actually jeopardize their health and well-being. Despite the contention of some that testosterone is the “bane of our existence”, leading to over aggressive behavior, increased rates of prostate cancer and heart disease, medical research suggests quite the opposite. BJ Penn likes to finish his opponents, and feels that the only way to find out who is truly the best is to get rid of the belts and get rid of judges decisions. He says that if neither fighter finishes his opponent, the fight should be ruled a draw. BJ says that the finishers will move up the ranks and make the sport much more exciting. Very interesting idea, although there's really no chance of ever seeing it happen. Here's the video of BJ Penn explaining the idea.